Roger that. Or rather, Pol Roger that. Yes indeed, the line up for Vinoland's annual New Year's Eve bubbly tasting includes a bottle of Pol Roger Brut Réserve (Épernay), along with a bottle of Louis Roederer Brut Premiere (Reims) and a bottle of Mumm Napa, 2008, Devaux Ranch (Napa Valley). A nice selection of bubbly, each one very distinct from the others, each one yummy in its own way. I wish everyone a very happy and healthy 2015. Happy New Year to one and all! The Oak Knoll District of Napa Valley AVA. 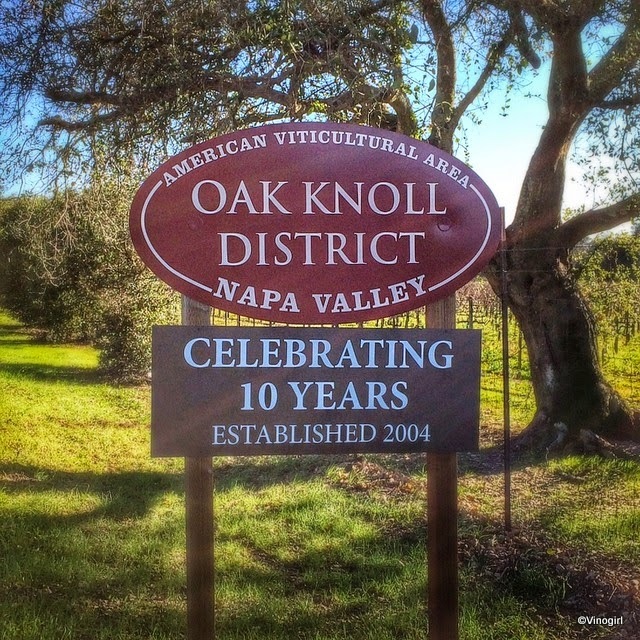 Situated directly north of the town of Napa, the Oak Knoll District of Napa Valley AVA has been celebrating its 10th anniversary this year. Congratulations to it! Calling this particular AVA 'it' is a whole lot quicker than calling it the Oak Knoll District of Napa Valley. However, I feel that 'it' is a tad incongruous, so let's call it OKDNV, afterall, it took an entire 10 years for the then Bureau of Alcohol, Tobacco and Firearms to approve OKDNV as the Napa Valley's 14th sub-appellation, so I feel I should be a little more respectful of the efforts and tenacity of those who put forth the initial proposal. When the vintners and growers of the proposed new AVA got together and decided to petition the government for AVA status they met with a small problem. The proprietors of a winery up in Hillsboro, Oregon, named Oak Knoll Winery objected to the use of the words 'oak' and 'knoll' for a new AVA in California. Claiming that the Californians had no "true historical and viticultural data" to support the proposed name, the Oregonians feared that there would be "customer confusion" and an Oak Knoll in Napa would "negatively impact" their ability to market the Oregon winery. The long and short of it is, the folks in the Napa Valley ended up with a moniker for their AVA which is a real mouthful. Still, it is known amongst locals as simply Oak Knoll. Cooler than most of the other AVAs, except Carneros and Coombsville, OKDNV is mostly planted to Bordeaux grape varieties. OKDNV is a relatively large viticultural area, encompassing 8,300 acres, and is home to about 40 wineries (and many growers also). Some of the more notable wineries, in my opinion, are; Blackbird Vineyards, Darms Lane Wine, Hendry, Luna Vineyards and Trefethen Vineyards. Seven down, nine to go. ...I felt like I'd consumed far too many calories over the past few days, so I decided to take V2 over to Alston Park, on the west side of the valley, for an off-lead walk. (Actually, we went over to Alston on Boxing Day also, but I didn't feel quite as, let's say, round two days ago.) Vinodog 2 had a lot of fun and so did I.
Alston is a nice park that climbs gently up into the western hills a little way. The views are quite pretty, north and east. Nowadays most of the park is surrounded by vineyards (don't know whose these vines belong to). The area looks a lot different from when I first visited the valley. The mustard is rather abundant in this particular vineyard: everywhere is so green with all this rain we have been having. The weather was beautiful, it had a nice crispness to it. Couldn't have asked for better dog-walking weather. Fun! A very Happy Christmas from everybody in Vinoland...that's me, Vinomaker and a bauble-wielding Vinodog 2! Wishing you all a joyful day filled with family, friends, good food and great wine. Enjoy! Not much to say really. This photograph says it all; nativity scene, a Napa vineyard, Christmas Eve. Thank you to a neighbour for their effort in ensuring that Christmas-walkies are very special for me and Vinodog 2. Happy Christmas Eve to all! As the sun was beginning to set today, I made my way almost to the top of Vinoland with Vinodog 2 to admire the view. Of course a few trees got in the way but not one, solitary raincloud spoilt the vineyard-vista. No, today I finally got to see the sun for the first time in what seems like ages. And how appropriate that the sun reappeared for a little while on the shortest day of the year, (although I did feel like I was being rationed). Funny story about the vineyard in the middle of the photograph (not that funny, actually). The gentleman who owned this vineyard passed away last year and in his will he had bequeathed the vineyard to the UC Davis Viticulture & Enology Department. But UC Davis didn't want it, they wanted cash instead. Apparently, contrary to what a familiar proverbial phrase claims, beggars can be choosers. The gentleman's widow is instead leasing the vineyard to Far Niente. Happy winter solstice, enjoy, be happy...for tomorrow it starts to stay lighter, later. This year is the 40th time that Anchor Brewing Company have produced their wonderful, limited edition Christmas Ale. The recipe might change every year, but it never fails to disappoint. This year the label is adorned with a charming ink drawing of a Sequoiadendron giganteum - the Giant Sequoia - which is a wonderful choice of tree this year. Giant sequoias are the world's largest tree and can grow to upwards of 275 feet. That's a lot of firewood! To be able to visit a grove of these majestic trees, and stand in the cathedral-like space beneath their lofty bows, is just one of the great things about California. Big tree. Big anniversary. Nice beer. Well done Anchor Brewing Company, and happy Christmas. I'm looking forward to your 41st edition. A star, a star, dancing in the night, With a tail as big as a kite. The folks over at Meteor Vineyard seem to be filled with the Christmas spirit, the gate to their vineyard is very festive. Meteor's shooting-star fairy lights made me and Vinodog 2 feel very exultant on our walk today. Grapevines everywhere are naked now. The onslaught of rain has beaten every last leaf to the ground, but I'm trying not to let it bother me. I put on a silly, but festive, wooly hat that I purchased when I was home last month to walk V2 this afternoon. If silly is synonymous with festive, then I am it. I have never had a Meteor Vineyard wine. Meteor produce a Cabernet Sauvignon, of course, that sells northwards of $225 per bottle, so I probably won't be trying it any time soon. But I do appreciate that the owners of Meteor Vineyard observe festiveness throughout the year. No 'shroom at the inn. One good thing, and only one, about all the recent rain that has fallen in the Bay Area (seemingly directly onto me), is the amount of fungi that have popped up around Vinoland, and the places that I roam about with Vinodog 2. There are mushrooms everywhere and the variety is amazing, each one a little more fantastical than the next. Whilst the Death Cap mushroom (Amanita phalloides) is not particularly weird to look at, it is grotesque in its reputation: the Death Cap is the mushroom responsible for the most mushroom related deaths worldwide. But what makes this non-native species so interesting to me is the fact that in California the Death Cap can be found growing under cork oaks (Quercus suber). This Amanita is considered a beneficial mycorrhizal fungus as it lives on the roots of live cork oaks, providing the tree with nutrients - such as magnesium and phosphorous - in exchange for carbohydrates. It is believed that Death Cap spores were first brought to North America on cork oak seedlings and it has since adapted to living on native California Quercus species. This particular 'shroom was growing, all alone I might add, under a very large oak tree (not a Q. suber) right next to the house. Yikes, I suppose I'd better take a good look at the cork that's bunging up this evenings wine offering. It's Gaudete Sunday. Once again I am paying homage to one particular rose-coloured candle by supping a rosé wine. This year's rosé selection is a Miner Family, 2013 Rosato of Sangiovese (Mendocino AVA). Made using the saignée method, this medium bodied rosé is huge on red berry-cherry goodness with a little candied-tropical thing going on (Thud, think Fruit Salad) and a deep, deep pink hue. Gorgeous. Today, rejoice with something pink. The climatic-claptrap from many Bay Area meteorologists on this past Tuesday night's newscasts had to be heard to be believed. You would have thought that an apocalyptic deluge of biblical proportions was going to wash this particular chunk of Northern California into the Pacific Ocean. Yes there was quite a bit of rain, beginning at 3.30 am on Thursday morning, but it wasn't nearly as much rain as the storm of last February. Around the greater Bay Area, as Thursday progressed, a lot of people were hunkered down behind mounds of sandbags, some parking lots were flooded, blocked storm drains caused problems on some roadways, a few trees fell over, a flat supermarket roof crumpled under the weight of standing water, stuff like that. However, Napa was relatively unscathed. Here in Vinoland we received 3 inches of rain in just under 24 hours. By English standards that's just a quick shower, but it isn't bad for California. Vinoland's creek was flowing swiftly, but wasn't even close to breaching its banks. We didn't even lose power which is very unusual, as normally one only has to look sideways at a neighbourhood transformer for it to give up the ghost (usually resulting in no power for at least 3 hours). Vinodog 2 and I were very bored being indoors all day. I hope the vines enjoy the resulting soil moisture content come the spring. All the grapevines in Vinoland have pretty much shut down. In fact, driving through the valley, there aren't many leaves on vines to be seen anywhere - except for some apparently virused vines that are hanging onto their bright red leaves a little longer. This particular node that I photographed, although it's a very nice node - nice bud, nice abscission scar, nice tendril - seems to be having a little trouble shutting down, as some of the tissue on this vine has not fully lignified. The wood of this shoot is still slightly green and soft. This vine also has quite a few petioles that are still clinging onto their shoot for dear life having abscised their individual leaf blades (the petiole usually separates with the leaf blade still attached). Now I'm not an expert, and if there is anyone out there that can enlighten me further please feel free to chime in, but I do know that poor lignification of grapevine tissue can be due to a number of factors, among them; virus infection, water stress, deficiency of nutrients (as well as an oversupply) and differing levels of phytohormones such as auxins and cytokinins. It's just one grapevine so I'm not unduly worried, but it does give me pause for thought. And something else to research about the life and growing habits of these fascinating plants. ﻿Just above the Rutherford AVA is the St. Helena AVA. Named after the town of St. Helena, this AVA covers approximately 9,000 acres. Besides being the home of my dear friends The St. Helena Sots, this storied AVA is home to many notable names/wineries such as; Corison Winery, Dancing Hares Vineyard, Flora Springs Winery and Vineyards, Louis M. Martini Winery, Pride Mountain Winery, Smith-Madrone Vineyards and Winery and Salvestrin Winery - a lot of wineries that mostly produce Bordeaux varietals. Of course, in my humble opinion, it is getting a little too toasty for the production of Bordeaux varietals up in St. Helena: it is just a tad too far north to benefit from the cooling influence of the San Francisco Bay fog. But that is just my opinion. St. Helena is also notable as the home of the first winery in the entire state of California to be founded and run by a woman, Josephine Marlin Tychson, c. 1886, (the winery is now Freemark Abbey). Josephine Tychson is a much more interesting St. Helena story, but that's just my opinion. Six down, ten to go. So much rain this week, I might as well be in England. California definitely needs rain, but all at once? Personally, I'd like a little bit of a break from being continually moist. However, I must admit, grudgingly, that due to the inclement weather there has been some spectacular cloud-action, peculiar (in a good way) light-quality and a few, if fleeting, rainbow goings-on...silver linings. Pity I kept forgetting my camera. I had it yesterday though. Here is an unusual view of Silver Oak Cellars and it's iconic water tower which is not normally this visible whilst driving along the Oakville Crossroad. There has been a lot of bulldozing activity of late in many vineyards. Given that harvest is well and truly over, now is the time that winegrowers begin the process of replanting a vineyard. Not many people realise that the vines that grow in front of Silver Oak are not Silver Oak's vineyards. No, they belong to Flora Springs. (Silver Oak grow their Cabernet sauvignon up in Soda Canyon). And Flora Springs has apparently decided to replant their Oakville vineyard. And I will get to witness the whole process. Fun.